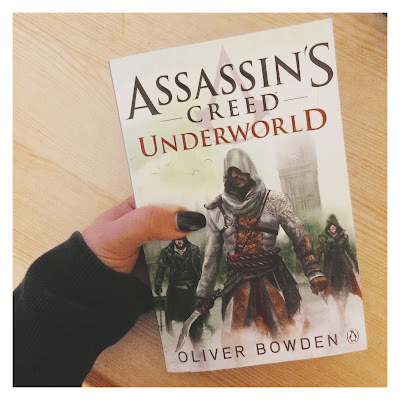 I want to start a new series over here called 'Book Review'...original, right? Basically, as you may have read, I have set myself the challenge of reading 36 books in 2017 and this book is my first. I started it because by January 3 I still hadn't picked anything up and I was super worried I was getting behind. Being a big reader, there was nothing in the house I hadn't read [another stipulation of my resolution] and therefore I chose the only thing I could in the circumstances. I wasn't expecting to enjoy it. After the first 5 or 6 chapters, I was hooked. I don't have a favourite genre of book, but I know what I like instantly. The start was slow, not boring but slow, and I struggled to stay interested. This may be because I haven't read for so long, but I can't be sure. I stuck with it, and it got to the point where I was going to bed early to read it, ignoring friends to read on my lunch break and packing it in my hand bag so I could fill empty moments with mystery, justice and fantasy. I'e always been a sucker for secret societies and impenetrable echelons of society and this book has so much of this. It's about the Knight's Templar, usually the good guys, and the Assassin's Brotherhood, the name denotes the bad guys, right? This book had me questioning things I thought I know and making me contemplate my understanding of right and wrong. The story line is interesting, in depth and fast paced. There's really not much downtime throughout the whole book, and whilst it's not incredibly well written I found myself devouring the chapters. I liken it to the voice and feel of a Dan Brown story or perhaps a James Patterson, not in the writing but in the heart racing, fast paced way in which you skim the pages desperate to learn more of what is happening to the fictional people whom invade your mind and spirit whilst pouring over the pages. The only thing I believe let it down, was the whole tone of the 3rd part of the story. It felt rushed, there was no detail behind storylines and I had to reread several areas to appreciate how much had happened in just a few short pages. After the first 2 parts of the story, I can't quite understand where the change came from. Maybe the writers deadline was looming, or maybe he was anxious we know what happened. Whilst I'm not sure if I will read the others in the 8 book line, I think it was a really good book to open up reading with again; it's eased me in and I am excited for some of the other books in my list for 2017. Do you have any recommendations of books? I still have 10 slots for the year to fill! Book 1 of 36 - done.